"Ira Sherman has been exploring the boundaries of metal fabrication and design since the early 1970s, both as a highly successful custom goldsmith and jeweler, and as an internationally recognized sculptor. His sculptural work uses materials and shapes from science and technology, yet “bio-engineered” to interact with the audience or viewer in a uniquely human way. Many of Sherman’s pieces are, in fact, “prostheses” created around a humorous social concept. These are worn on the body, and may be shockingly intimate. 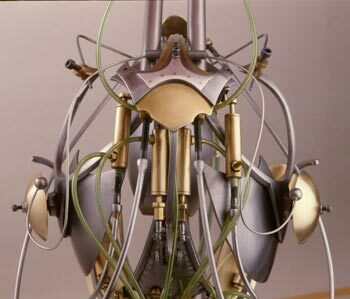 Many of Sherman’s sculptures have sensors that let them interact with the participant or the audience. Parts of his current traveling exhibitions, "Panaceas to Persistent Problems" and "Impenetrable Devices" have been displayed in exhibitions in the U.S., Canada, Europe, Israel and Japan; the Spertus Museum , the Smithsonian Renwick Gallery of the National Museum of American Art and the National Ornamental Metal Museum have recently acquired Sherman art work for their permanent collection." 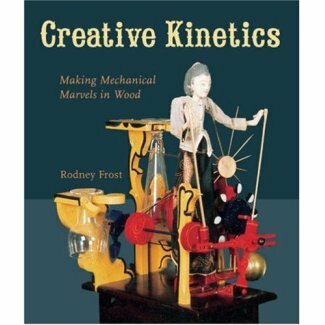 Big thanks go out to KineticWorld reader Rob Nehring for bringing our attention to Ira's work. Japanese artist Ujino Muneteru uses a wide array of old household appliances, as well as many other familiar objects, to produce some pretty cool sounds. PingMag has an article and interview up, written by Vicente Gutierrez. "Not exactly your grandmother's living room, is it? 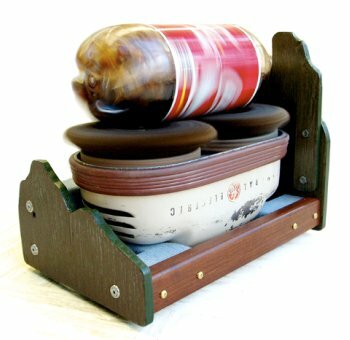 Side stepping the equally playful and bizarre worlds of Chindogu, artistic inventor Ujino Muneteru spends his time developing phallic (and other) instruments called Rotators made of household appliances, tools or furniture and precisely arranges them into a neat bento of sounds. With a coming exhibition in Berlin, PingMag caught up with the noise boy to talk shop about all things analogue." Special thanks to KineticWorld reader Anthony Disimone for sending us the heads-up! 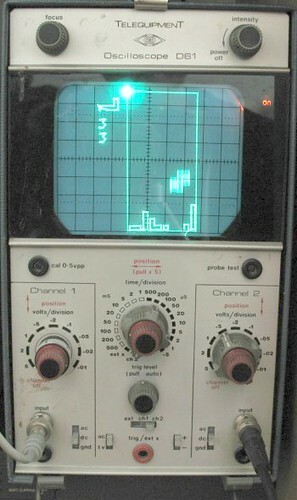 Lars Pontoppidan created a Tetris game using a simple microcontroller for the program, and a standard oscilloscope for the screen, and called it Scopetris. For those of you who saw my post about the oscilloscope clock, and saw how excited I got - well this is even cooler. You see, an oscilloscope is a fairly boring piece of equipment, that sits around the shop waiting for something to do, and then when you use it it shows you waves (changes in voltage over time) and then you move on. It is a tool that was never designed to show an image of something other than those voltages over time. These projects change all that. No, this isn't some earth shattering advance in technology, it's simply hacking at its very finest. A shout out to Rolf van Widenfelt for bringing this project to our attention.